Classes began. The most prominent of these classes was British Studies, not only for its ladybug-befuddling potential, but also because every student at Harlaxton is required to take this class. British Studies is composed both of lectures and seminars -- the lectures are given to the whole class of 176 students, and are followed by seminars of about 20 students. All four British Studies teachers take turns lecturing to the class; on that particular day, Dr. Bujack -- a witty teacher with a most resounding character -- gave the lecture. He introduced the main themes of the class: what defines "British-ness", how the British came to be, what role did Europe play in forming Britain and British culture, how being an island influenced Britain, and so fourth. The class sounded -- and continues to sound -- quite interesting. And, while I'm not a liberal arts major, I am definitely glad that I get to experience some more history- and literature-oriented topics throughout my studies at UE. 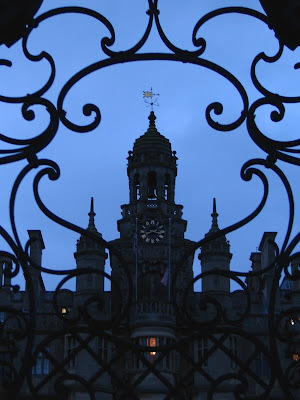 On Tuesday evening, on somewhat of a whim, I decided to spend Wednesday in London. The decision process was actually a bit more rational: it suddenly occurred to me that classes end on Wednesday at noon, that Katrina would be in London for that whole day on her way to France, that the train ride is fairly short and fairly cheap, and that basically I really needed to see Katrina for the short while that we were both in the same country. I had about an hour on Wednesday to walk around campus before taking the shuttle to the train. 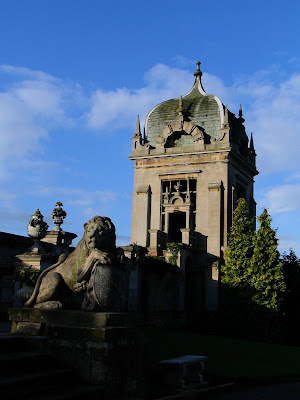 The day was one of the most beautiful Harlaxton days so far -- sunny, with clear blue sky and a light wind, the day seemed to reflect my joy at the thought of seeing Katrina. 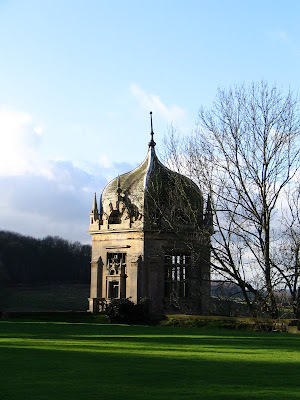 I sat on the hill above Harlaxton for a long time, letting my mind wander and letting my soul take part in the restless travels of the wind. "The hills are alive with the sound of music" -- no other line could describe that day any more accurately! I arrived to London at 3:30, and, more surprisingly, was easily able to find Katrina amongst the thousands of people coming in and out of the train station. The weather at London was not as pretty as it had been at Harlaxton, but, to paraphrase Mary Poppins: "When the day is gray and ordinary, Katrina makes the sun shine bright!" 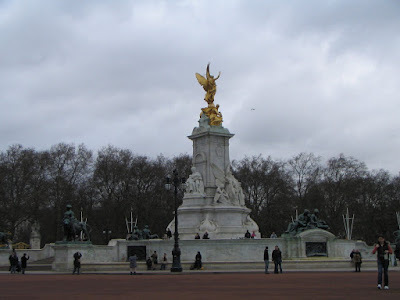 After stopping by Katrina's hotel for a short while, we continued to walk to a nearby park and then onto a bridge right next to Parliament: "On the rooftops of London... Cool! What a sight!" Also at London, Katrina and I went to see the Phantom of the Opera. This year was the 20th anniversary of Andrew Loyd Webber's famous production, and, having seen and loved the movie, Katrina and I now decided to see the stage performance. The show was indeed spectacular, in almost every respect: fabulous costumes, great dancing, good voices, a beautiful orchestra, phenomenal sets and scene changes, and several absolutely gorgeous effects (the rising of the chandelier at the beginning, the boat on the misty lake, and the masquerade). The only thing missing in this splendor was genuine acting; the actors seemed to have grown tired of their characters. There was a sense of detachment throughout the whole show that no amount of special effects or fancy mist could mask. And so, while I enjoyed the Phantom for its scenes and its spectacle, and am definitely glad that I've seen it, the stage production was not as emotionally moving as the film version. Aside from sleeping through half of my psychology class on the following morning, the rest of the day was quite wonderful. 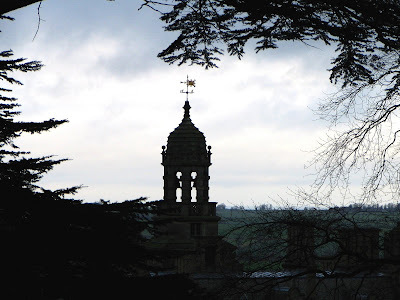 After classes, Paul and I went on a walk and discovered a "perfect" tree -- a beautiful tree that stood atop a hill, was easy to climb, and had a spectacular view of the Manor. Later on in the evening, half of the campus showed up at the Great Hall for a school-organized Celtic Dancing activity. A band of five or six members played fun traditional Celtic tunes, teaching us how to dance to them as we went along. The dances were group dances, typically requiring four pairs of partners (a guy and a girl, though our campuses' girl-to-guy ratio required many girls to dance as "guys"), and involving relatively simple movements. Among the more common "themes" of the dances were stepping forwards or backwards, circling with a group, swinging around with a partner, stealing someone else's partner, galloping with a partner, or "stripping the willow" -- a curious group-weaving dance that is best described on http://www.geocities.com/Colosseum/Midfield/3705/StriptheWillow.htm. Both the music and dancing were great fun, and the frolicking structure of the dance was absolutely invigorating. The frequent (and often unpredictable) exchange of partners was likewise a great chance to meet fellow students, and it also created a lighthearted atmosphere in which even those with girlfriends/boyfriends overseas did not feel awkward in dancing with others. After the dance, Paul, Lindsey, Scott and I went on a refreshing walk through the starlit gardens, which was also quite wonderful. 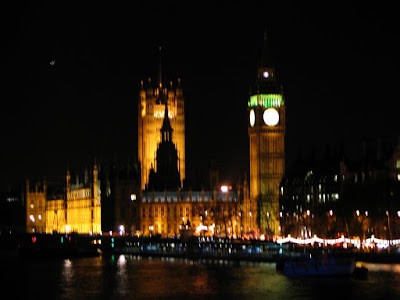 The following day, on Friday, I went on a school-organized trip to London that lasted through Sunday. The first day passed rather uneventfully, as it included just transportation to London, a visit to the British Museum, and lots of aimless meandering in the evening. The second day was filled with many more activities and sights, and much more purposeful meandering. 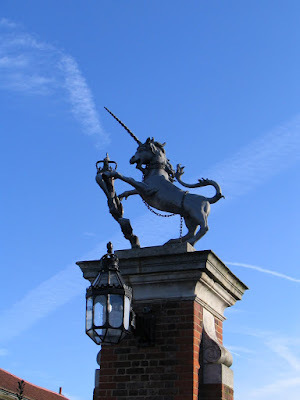 As for the last day, it again included a rather lengthy transportation back to Harlaxton, but it also entailed a fabulous visit to Hampton Court Palace. When we first arrived to London, Paul, Lindsey, Scott, Sasha, and I went to visit the British Museum, agreeing to meet each other in two hours, and meanwhile exploring the museum at our own pace. For myself, instead of stopping at each artifact and examining it in great detail, I slowly walked through the halls and the isles, letting my mind try to grasp the wholeness of a civilization's progress. The museum was so vast, however, that in two hours I had time to walk just through the African, Chinese, and Egyptian exhibits, so I definitely plan to return to the British Museum again. I think it was the Egyptian exhibit that impressed me most. The arts and artifacts from other civilizations were also quite amazing, but Egypt impressed me most with how calm and monumental its art seemed. Its drawings and hieroglyphs, inscribed in big writing on huge stones, were awe-inspiring. Here was a civilization whose work spoke not only of beauty, but of power. 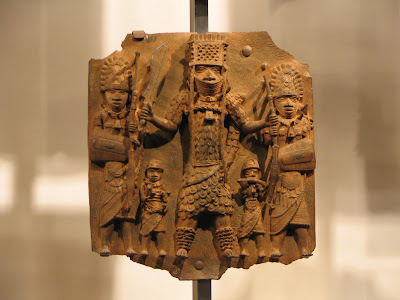 And yet the stone tablets also inspired a feeling of trust: a word chiseled into the stone was a word of permanent record, and the greatness of the stone and the mightiness of its civilization would mean that the civilization would not go back on its word. The stones were so rudimentary, so earthly, and so great that it was impossible to imagine that the empire who erected those stones would have ever collapsed. Deep within each stone lay a dormant mark of the Egyptian civilization, and that mark would remain there forever. 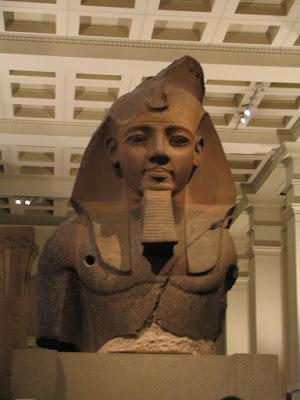 Most impressive of all was a giant sculpture of the head and upper body of a Pharaoh. The Pharaoh stood on a stone high above the crowd, watching over it with magnificent power, wisdom, and calm. Also impressive were several stones that depicted images of battles or animals, with hieroglyphs written right atop of them; in a textured 3-D stone work, it was indeed possible to combine image and writing atop each other, yet still view each separately. 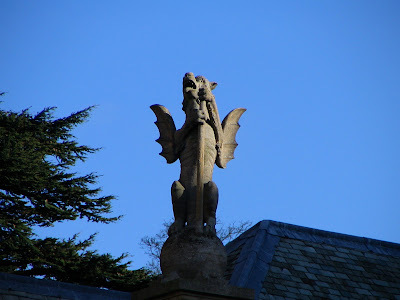 One such stone that depicted a dragon actually benefited from the hieroglyphs: placed on the dragon's body, the hieroglyphs served as the dragon's scales in addition to telling their own story. After the museum, our group meandered for a total of five hours, most of which occurred after sundown. 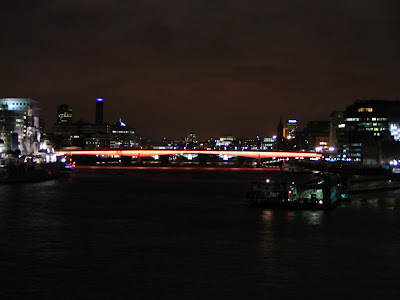 Had we meandered in downtown, amidst lights and crowds of people, perhaps it would have been quite fun; as it was, though, we meandered in giant circles around equally un-picturesque neighborhoods in some dark suburbs of London. There were still some fun dialogues and some enjoyable moments, but the evening seemed largely a waste (especially compared to the wonderful evening that I spent with Katrina in the same city just two days before). I realized again that I'll never be a city person: bars, clubs, drinking, shopping, and much of everything else that happens in a city simply do not appeal to me. I felt rather unneeded and lost in the nightlife of London; no wonder the cat in Mother Goose had nothing better to do than frighten a mouse underneath the queen's chair! But my impression of London was much improved with the coming of the next day. This time our group had a set plan -- we were going to visit a number of destinations in London, moving between them in an orderly fashion. We also bought day passes for traveling on the London Underground and busses. Thus equipped, we set out (for now, just walking) to the British Library. Before I move on to the various places we've seen in London, perhaps I should mention something about the city. London has a wonderful underground system, with trains departing from each stop every several minutes, and an equally wonderful bus system with buses coming and going roughly every ten minutes. London is definitely a walking city -- it is quite easy to walk from any point in central London to any other central point, and to do so reasonably fast; the only reason we got the day passes was to guarantee that we wouldn’t aimlessly meander again, and because we were tired of walking so much the previous day. I should also point out that walking in London -- at least in the more touristy areas -- is like being lost in the fog with friendly beacons every several blocks: while it was nearly impossible for us to know where we were in London at any given moment, large "Underground" signs with the name of the station written on them shed momentary light onto our location in London. The British Library held an impressive collection of early writings: the Magna Carta, early illustrated and embroidered bibles, beautifully illustrated Chinese poetry, the original publication of Galileo's book, original Shakespeare plays... It felt almost surreal -- and definitely very flattering -- to stroll through such a wealth of cultural and literary works. From the Library we took the Underground to Buckingham palace, followed by Westminster Abby and Big Ben. Crossing the Thames River, we looked at the Houses of Parliament once more, and were once again impressed by the Parliament's prominence and beauty. Walking along the Thames River, we came to a beautiful church and stepped inside for a moment of peace and tranquility amidst the busy streets of London. As we continued along and crossed underneath London Bridge, we saw three street musicians playing Mozart with great vigor and beauty. All three turned out to be Bulgarian music students studying at a London university, and they clearly enjoyed playing music! A large crowd gathered around them, and we too stood and listened for over half an hour, donating to them their well-deserved money. Unfortunately, as we were ready to go away, some policemen came by and told them that they must get a permit before playing on the streets (something that has not happened to them in the four months of their street musician career). However, we sincerely hope that they'll be allowed to play again, and that they will continue to grace with their presence the rather bleak tunnel -- and later, hopefully, a rather filled concert hall -- of London. After a very brief visit to a modern art museum, I separated from the group and went back to cleanse my soul at the beautiful church. From there, at the approach of darkness, I walked to and around the tower of London, and then headed to the Tower Bridge, where I stood for a long time. 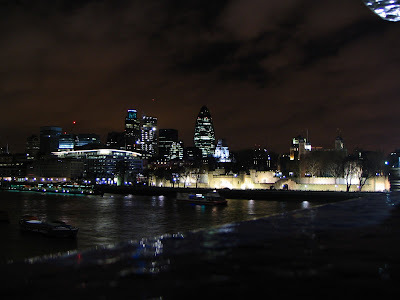 An amazing contrast unfolded from where I stood, with the 900-year-old tower standing on the banks of Thames River, lit up by powerful 21st century lights and surrounded by modern boats and modern buildings, and yet seeming awkwardly in place within London. Huge crowds of visitors and residents rushed or sauntered past me, taking photos, eating sandwiches, or listening to their omnipresent iPods. I was the only one not moving on that bridge. As I stood there, detached from the rest of London and its restless people, I suddenly understood what makes a city: people -- each pursuing their individual activities and dreams, but, in doing so, acting in a collective unison. I too was part of that unison: an observer -- a shadow -- amidst the sea of a moving crowd. We were each fulfilling our roles, and it were those roles that ultimately combined to form the vibrant environment of a city. In the evening I rode a double-decker bus to Trafalgar Square and back. The bus ride was a lot of fun: sitting in the front row on the upper level, I could see far and wide beyond the cars in front. Spasms of headlights, blinkers, and taillights flew by in the crazy jungle of London traffic. It felt like sitting in a moving radio tower -- a tower that kept narrowly avoiding being sucked into the fast-paced stream of light. Back at the hotel, I stumbled upon my second concert of the day. A large crowd gathered in a room adjacent to mine, singing old Russian songs to the accompaniment of an accordion. As they sang beautifully (with a lead singer and several supporting voices), and as their voices carried loudly into the hall, I sat in the hall and enjoyed listening to them immensely for the next half-hour. It turned out that they had performed in a Russian parade at Traflagar Square earlier on that same day! It's too bad that I did not get to hear them there, but at least I caught the tail end of their impromptu hotel performance! 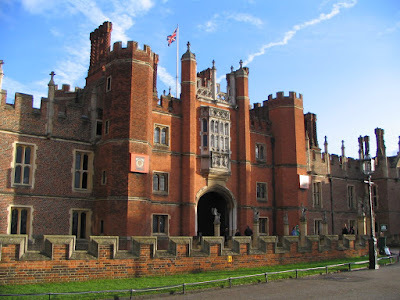 The following morning our group left London to visit Hampton Court Palace. 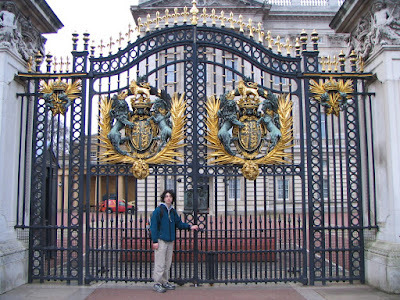 The palace was magnificent: built under Henry VIII, it reflected the lavish splendor of the time. With a spectacular Great Hall, a great number of rooms, a rich display of paintings and sculptures, and a majestic chapel with painted gold stars on a dark blue background, the palace was a testament to the riches of the English Crown of the time. 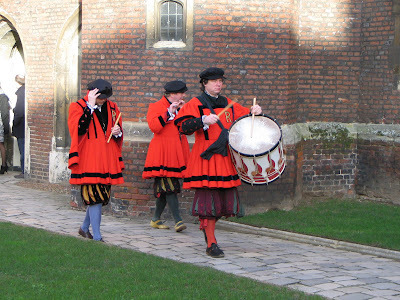 A number of actors and musicians walked about the palace, speaking of the then-buzzing news ("Ah, good sires, thou have come in merry time for our mighty King's marriage to Anne Boleyn! "), or minstreling before the crowd! The Palace was surrounded by beautiful gardens, with ponds and fountains and trimmed trees. 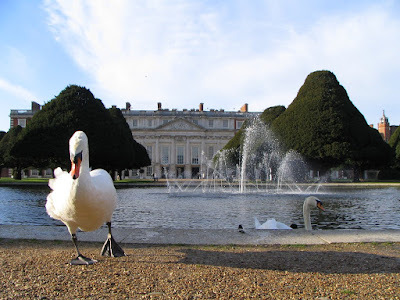 Numerous swans swam in the ponds, occasionally stepping out to seek bread crumbs from visitors. Birds chirped in the trees, the sun shone though a mostly-clear sky, and the Palace and its gardens were a model of peace and tranquility. What a beautiful day! 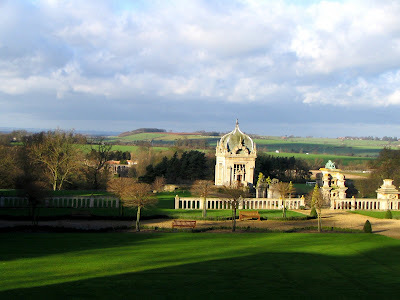 Three hours later, our group got back on the bus and returned to Harlaxton. The first week of school -- and the London weekend -- were complete.